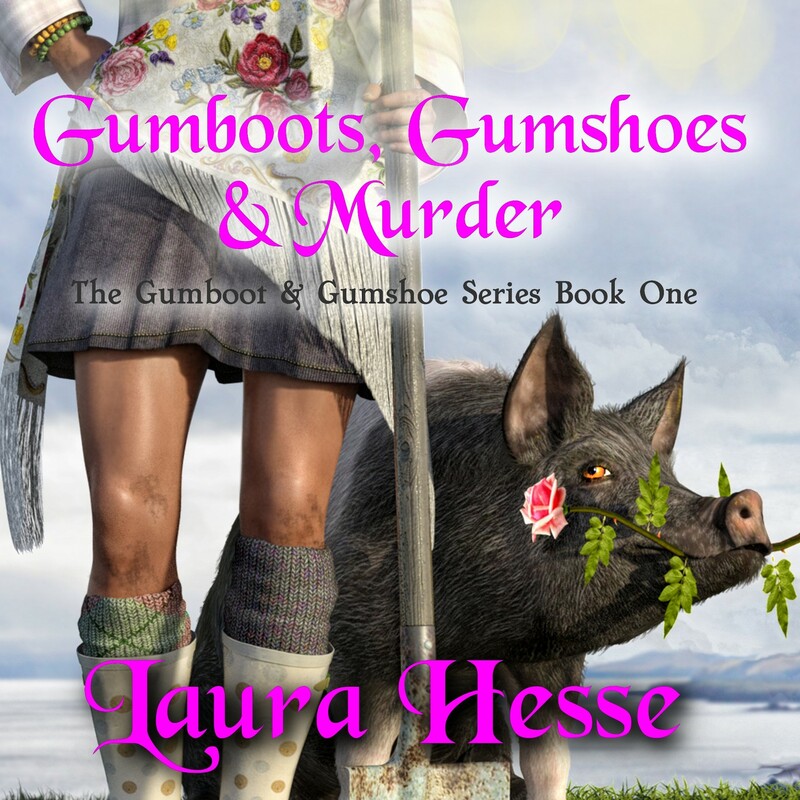 I am so pleased to announce that the screenplay, Gumboots, based on my novel Gumboots, Gumshoes & Murder was a top 3 winner at the recent New Media Film Festival in Los Angeles. It is so cool to have your work recognized by seasoned professionals in the industry. It is just the motivation I need to kick start the rest of the series. Narrated by the very talented, Shelley Reece. Click on the CD cover to hear (and watch) a preview of the audio book for Valentino. Coming soon in August 2018. Thank you to Autumn Sky, the wonderful young artist who did the graphic design on this cover. She did an amazing job. I am hard at work on The Dastardly Mr. 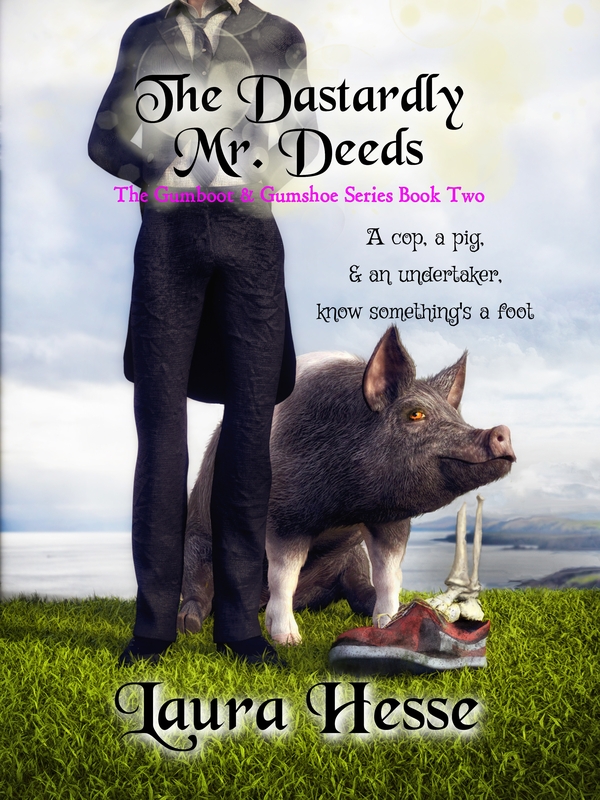 Deeds, the second book in The Gumboot & Gumshoe Series. It is one of the toughest books that I have written as I have to write two books in one. I don’t want to get too much into the plot with this as I’ll give too much away. Suffice to say that Gertrude and Sgt Betty Bruce return in a search for the answers to the feet in sneakers that keep washing up on the beaches on various islands along the British Columbia coastline, including Seal Island. Between the sawed off feet and the body of a woman that washes up on shore, Betty has her hands full so is it any wonder that she has to put her search for a serial killer on hold. Gertrude and her bestie, Peaches, ran amuck, trampling flower beds and scattering Morris Tweedsmuir’s goats to the four winds once again. On a whim, they decided to race across the boardwalk that joined the grocery store, hardware store, and the Bristling Boar Pub together. People scrambled out of their way. Someone left the pub’s door open and the duo barged in. An athletic and still quite striking grey haired man with a twinkle in his eye and the red nose of an alcoholic sat at the bar. He laughed and turned his attention from the regal blond woman sitting beside him to the wayward pig. He offered Gertrude the rest of his beer. Before the pig had a chance to quaff it down, Gwen Mann chased Gertie and Peaches out of the pub with a broom. Gertrude squealed in disappointment and Peaches bawled, the cow’s feelings positively hurt by the expletives that came out of the tiny Malaysian woman’s mouth as she smacked the Jersey cow’s bottom. In their hasty retreat, the unstoppable duo knocked over trash bins and broke down the porch railing on the outside deck before leaping down the two steps to safety. The men in the pub cheered raucously, their faces glued to the windows. Eighty year old Archie Bruce stood on the pub steps, beer in hand, amused. It was just another day on Seal Island. As he ran a hand through his head of thick silver hair, he thanked his lucky stars given recent events on the island. Loves were lost, new ones formed, and then those too were lost. It was time to enjoy the simple things in life once again and watching his rotund pot-bellied pig and her Jersey cow cohort wreak destruction wherever they went cheered him up considerably. The pig and Jersey cow were his problems now since he had adopted Peaches after her owner died in a most spectacular fall. He saw his daughter, Betty, looking down the hill from the cemetery, the church steeple rising above her like a shining white beacon of light against the darkening rain clouds above it, and raised his mug to her. Betty waved back, finding comfort in the fact that on Seal Island, no matter the tragedy, some things never changed…and then her cell phone began to ring! Betty looked at the cell phone’s display. Doc Forester’s name flashed across the screen. She sighed wearily. Now what? “Hello,” she answered, annoyed. She had asked the detachment commander to cut her some slack, at least for a day or two. The raven that had been watching her lay flowers on the graves of her old friend, Eliza Bone, and her handsome beau, slash torrid romance writer, slash serial killer, Andy McDowell, returned, as if out of nowhere. It settled upon Eliza’s headstone, its golden eyes meeting Betty’s own. A large black wing feather fluttered to the ground. She listened to Doc Forester’s gentle voice, his words penetrating her heart. Betty’s hands began to tremble as Andy’s last words and final moments flashed through her mind: his words, his uncharacteristic rage, the beseeching look in his eyes as he tumbled over the cliff. The grey haired man with a Rudolph nose and flushed cheeks wandered out of the bar. He stopped beside Archie. “You’ve got your hands full with those two, Archie,” Barney Whyte joked with his best friend and poker buddy. “And pay for the damages,” Barney. Barney eyed Betty as she paced back and forth in the cemetery, talking on her phone. She was clearly agitated. His eyes narrowed as he watched her. “See you later, Archie,” Barney mumbled, stepping down the porch steps. “Wife’s not going with you,” Archie asked. “She’s waiting for my pilot to get here with the float plane. Going to go do what all my wives seemed do best,” the old man growled. “That’s the idea,” Barney answered, tugging his hoodie up over his head. …but we all know it’s true. The one aspect that doesn’t get talked about in the blog posts or news articles, but is always present in our minds. We don’t even like to talk about it with each other. But in hushed tones, maybe off in the corner of a conference, it get’s mentioned. And those within whisper shot will nod in agreement. I speak of The Burden. The Burden that we all share, and some have trouble handling. The Burden that is the life of an Indie Author. We are SO FREAKING AWESOME. It can be too much at times. Awesomeness isn’t to be taken lightly. There are people who work in offices and cubicles that will never know the joy of getting a 5-star review from someone who didn’t give birth to you. They will never know the joy of royalty revenue. Their lives will NOT be spent creating worlds, friends, and lovers doing the most amazing things. The happiness that comes with naming a character after someone who pissed you off in high school, and then killing them, will be never be felt. We travel to the stars with, solve the greatest mysteries of, and dig into the souls of the most interesting people in the universe…our people…the ones we lovingly built. Yes, but in the best possible way. Yes, and they’re jealous. Being AWESOME is a burden. I know that everyone of you has felt this burden…because YOU ARE AWESOME, TOO. Don’t let your own AWESOMENESS weigh you down. Just accept it. Now back to your regularly scheduled group posts.